John Lynas and Danny Price will team up for the challenge. An office-to-office challenge will take two civil servants on a tough tour in honour of Bradley Lowery and another cancer fund. Danny Price, Jobseekers’ Allowance manager for the Department for Work and Pensions at Wearview House in Sunderland city centre and its sister base in Stockton, and team leader John Lynas, will leave the Teesside site and head for Wearside on their bikes. Tomorrow’s event will see Danny run the 30-mile journey back, with John planning to stay on his cycle, covering 120 miles by repeating the trip again. 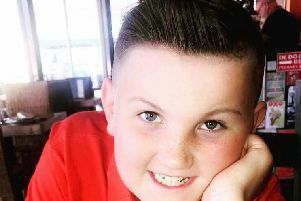 The cash they raise through their Tour de Stock’land will be donated to the Bradley Lowery Foundation, with half to go to Cancer Research, as Danny’s mum Jan Price, 73, was last year treated and has since recovered from the disease. Six-year-old Bradley, from Blackhall Colliery, died in July 2017, after doctors found his neuroblastoma cancer could not be beaten. Danny. 40, who lives in Marsden in South Shields and is dad to Cooper, six, and Reid, five, recently retired as a player-coach for Castleford in West Yorkshire. When I read Bradley’s story the saying ‘no brainer’ came to mind and I know that many have been equally inspired by Bradley and his ‘Never Give Up’ attitude. He said: “The plan came about because I had to retire from playing rugby in April and I needed something else to keep me fit. “When I told my good mate John about the challenge he said why don’t I do it with you and the final challenge was born. “Cancer charities are close to both our hearts and we wanted the Bradley Lowery Foundation to be one of them. “When I read Bradley’s story the saying ‘no brainer’ came to mind and I know that many have been equally inspired by Bradley and his ‘Never Give Up’ attitude. “That’s also because it’s local and I think the work that Cancer Research does is really important. “Many of us have been impacted by cancer and when my mum told me last September that she has the ‘Big C’ it blew my world apart. “Like me she is a tough old goat and she beat it, now fully recovered and loving life again. “We’re both excited about doing it and we’re both pretty fit, but 30 miles is a long way and then we’re coming back again and for John, he’s covering 120 miles too. Danny and John, 61, from Cockfield near Barnard Castle, have set up two donation pages so people can pledge their support for the funds. The one to back Bradley’s fund, set up to help the families of sick children, can be found via https://bit.ly/2DQKB28 while the one launched for Cancer Research can be found through https://bit.ly/2IxNOT0.